Sinigang na ulo ng Salmon sa Miso has been a popular dish nowadays because of the abundance of salmon heads in the market. Every part of the salmon is now being sold, After filleting the salmon, bone scraps are sold as trimmings, and the head sold separately. 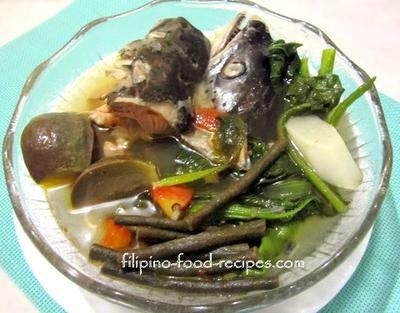 The most common dish for the salmon head is sinigang or sour soup. You don't need a lot of fish to make a pot of soup, and adding a lot of fresh vegetable such as string beans, eggplant, okra, kangkong and miso can feed a family of 4 - 6. 1. Parboil the salmon in water for 2 minutes. 2. Drain and set aside the fish. 3. In a separate pot, saute garlic, onion tomatoes, ginger and miso. 4. Add the radish, long string beans, water and sinigang mix. 5. Add the salmon head and bring to a boil. 6. Stir in the kangkong. 7. 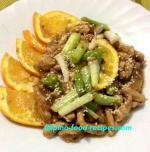 Serve hot with white rice.